Time for a BIG Easter Giveaway! Thank you to everyone for visiting and leaving such sweet comments all year even tho my posts have become thinner of late!! Please remember to use my 'search' box over on the right to find all my previous Inspiring Ideas for every holiday and event and occasion you can think of! Here are all the Easter Ideas. Lots of resources in here! Prize #1: Metal Wall Ichthus: I get tons of feedback on this metal piece I designed for DaySpring . They were so gracious to offer this last one to give away to one of my lovely readers!!! Score!!! 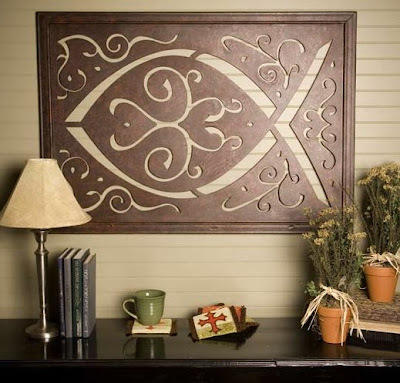 This iron wall piece features the Ichthus or fish symbol used by those who believed in and followed Jesus after his resurrection – Christians. And as we come up on Easter, it's the perfect time to reflect on that amazing gift of God. The piece measures 40 x 28 inches, and will make a dramatic statement in your home or office. This art is also reversible so you have 2 color tones to match your decor.Yeah! Of course, one graces my home and I'd love for it to be in yours, too!! Thank you, DaySpring . One winner will receive 1 Metal Wall Ichthus! Choose your favorite print from my Vintage Inspiration collection or my modern Christian art in my Etsy shop. One winner will receive his/her choice of one 8x10 print from my Etsy store. 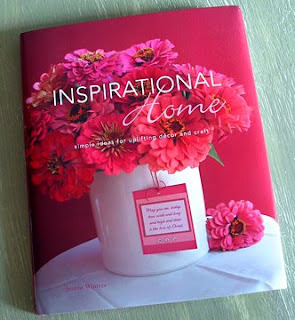 Prizes #3 & #4: A copy of my book Inspirational Home: This hardcover book is subtitled "simple ideas for uplifting decor and craft." It is loaded with beautiful full color photos of the kinds of ideas you see me do here. AND there are complete instructions. It's a craft book and a pretty coffee table book - prepare to be inspired! You can read more about it on my Book page. Two winners will receive a signed copy of my book Inspirational Home. THE GIVEAWAY: FOUR PRIZES, FOUR WINNERS! Two ways to enter: comment below and "LIKE" my artist Facebook page!! Everyone can have two entries!! Please pop over to Facebook and Like "Jeanne Winters." Contest is open until midnight MT, March 28th. Winners must have a US address I can ship to. Leave your email or a way to contact you if you win! I'll announce winners shortly thereafter. Ichthus is a gift from DaySpring.com. My links to them are affiliate links.